What are SolarWinds Kiwi CatTools? I don’t usually start a review with a negative, however, it will save time if you realize that this backup utility is not for file systems, but it is for configuration settings on hardware devices. Having cleared up that the purpose of CatTools is to back up devices such as, Cisco routers, Nortel switches and ASA firewalls, I can now move forward and encourage you to try a free download of Kiwi CatTools. The main benefits of these freeware CatTools are storing current and previous versions of your hardware configuration settings, and providing a central GUI where you can monitor information settings, and if necessary, make changes. Sooner or later something will go wrong with a router or a firewall, but CatTools will send you an alert that keeps you one step ahead of the hackers, or the users! When troubleshooting, the ability to compare past and present configurations will save time in finding the change. One day the roll-back facility will restore a working configuration and save your bacon. Impress your manager, or cover your back, by distributing reports (provided by CatTools) of how well your devices are configured. I’ll bet that you will find another feature of CatTools that I don’t use, but will be just what you need. (Bulk Changes are too bullish for me). The download, unzip, and the program’s install are truly easy. Furthermore, if CatTools works on a 64-bit Windows Server 2008 machine then you will have no problem installing on any current Windows 32-bit server or desktop operating system. Your only real setup decision is whether to run as application or as a Windows service. I chose to install the Kiwi CatTools as a service, and selected the default of LocalSystem account. Incidentally, if you need to manually configure or restart the service, it appears under ‘K’ for Kiwi and not amongst the ‘Cs’. 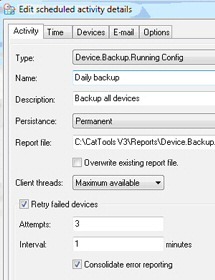 CatTools is designed to back up configuration information about the various devices on your network, but first you have to provide information to the utility. The ‘Devices’ tab has a pick list of common network hardware, you then fill in the details such as the IP address, port number and connection method. The only difference between the free and licensed version is the increase in the number of devices you can monitor from 5 to unlimited. Talking of devices, over 60 are supported out of the box, and believe there is a facility for advanced users to create a custom device. I have heard of few problems with CatTools, the only glitches come from upgrading to version 3.3.14 from previous versions. The solution is to uninstall, and reinstall. Appriase SolarWinds Kiwi CatTools – Watch This Video! NCM will assist you in creating consistent settings for routers and other network devices with config files. For example, you can ensure that only the correct firewall ports are open. Not only will you be able to monitor all manner of data vales, but more importantly, NCM provides the tools to restore settings in the event that someone makes a mistake, but you cannot quite pin-point the error. For example, you can upload scripts to correct problems with community string, passwords or other device settings. See more on Orion NCM. In this review of Kiwi CatTools I would emphasise that it really is easy to download and setup. The benefit is that you will have peace of mind that your configuration data for routers, switches and firewalls is safely backed up. An added bonus is that through trying this free utility you will learn more about the settings of your network hardware. These are programs which I have enjoyed evaluating on my network. Some are completely free, while other downloads are trial versions of the full product. I think SolarWinds have a great strategy, namely, supplying a free gadget, which may be all a small company need, yet providing a big-brother suite of programs for larger organizations.